Cheow Lan Lake is a 165 km² man-made body of water that was created in Khao Sok National Park after the Thai government and Electricity Generating Authority of Thailand (EGAT) decided to build the Ratchaprapha Dam, blocking off Klong Phrasaeng, a tributary of the Phum Duang River in the southeast of the park. The Ratchaprapha Reservoir, as it is officially known, took about three years to fill and displaced around 385 families from Ban Cheow Lan village, who were resettled in other parts of the region. Although Ratchaprapha Reservoir is the lake’s official name, during construction it was often referred to as the ‘Cheow Lan Project’, leading to the reservoir’s more popular name today: Cheow Lan Lake. 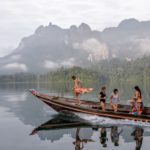 Contrary to popular opinion, the lake does not take up a major part of Khao Sok National Park, accounting for only about 22 percent of the park’s total landmass. 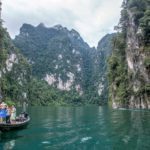 However it is a major attraction for visitors to Khao Sok, who can hire local boats for day trips, and to overnight in one of the many raft house accommodation options on the lake. These are both government and privately-owned bungalows that enable visitors to spend a night or two floating on the lake enjoying the beauty of the natural surroundings. 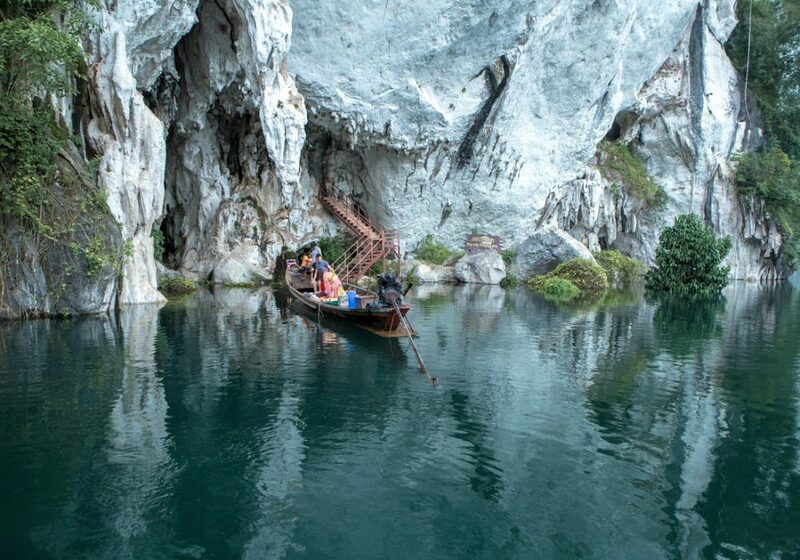 All sorts of activities can be carried out on the lake including trekking, visits to a number of stunning waterfalls and cave complexes, kayaking and rock climbing.